Christopher Dresser (4 July 1834 in Glasgow – 24 November 1904 in Mulhouse) was a designer and design theorist, now widely known as one of the first and most important, independent designers. He was a pivotal figure in the Aesthetic Movement and a major contributor to the allied Anglo-Japanese or Modern English style, both of which originated in England and had long-lasting international influence. Dresser was born in Glasgow, Scotland, of a Yorkshire family. At age 13, he began attending the Government School of Design, Somerset House, London. He received training in design and took botany as his specialization. He lectured on the new subject of Art Botany to complete his studies before his appointment in 1855 as Professor of Artistic Botany in the Department of Science and Art, South Kensington. He wrote a series of articles that appeared in the Art Journal in 1857, "Botany as Adapted to the Arts and Art Manufactures". In 1858 he sold his first designs. In 1850 the University of Jena, Germany, where Schleiden held the chair, granted a conventional doctorate to Dresser on his submission of his books Rudiments of Botany (1859) and Unity in Variety (1859) and a short paper on plant structure; as Dresser did not attend the university his doctorate was awarded in absentia. From this early date his design work widened to include carpets, ceramics, furniture, glass, graphics, metalwork, including silver and electroplate, and textiles printed and woven. He claimed to have designed "as much as any man" at the International Exhibition London 1862. As early as 1865 the Building News reported that in the early part of his career he had been active as a designer of wallpapers, textiles and carpets, and the most active revolutioniser in the decorative art of the day. He wrote several books on design and ornament, including The Art of Decorative Design (1862), The Development of Ornamental Art in the International Exhibition (1862), and Principles of Design (1873), which was addressed in the preface to "working men". In 1899 The Studio magazine found it was possible to quote this book "page after page and not find a line, scarcely a word, that would not be endorsed by the most critical member of the Arts and Crafts Association today." In effect Dresser set the agenda adopted by the Arts and Crafts movement at a later date. In 1873 he was requested by the American Government to write a report on the design of household goods. En route for Japan in 1876 he delivered a series of three lectures in the Philadelphia Museum and School of Industrial Art and supervised the manufacture of wallpapers to his design for Wilson Fennimore. He was commissioned by Messrs Tiffany of New York to form a collection, whilst in Japan, of art objects both old and new that should illustrate the manufactures of that country. In four months in 1876/1877 Dresser travelled about 2000 miles in Japan, recording his impressions in Japan, its Architecture, Art and Art-Manufactures. He represented the South Kensington Museum whilst in Japan, and was received at court by the Emperor, who ordered Dresser to be treated as a guest of the nation – all doors were open to him. He was requested by the Japanese Government to write a report on 'Trade with Europe'. His pioneering study of Japanese art is evident in much of his work which is considered typical of the Anglo-Japanese style. From 1879 to 1882 Dresser was in partnership with Charles Holme (1848–1923) as Dresser & Holme, wholesale importers of Oriental goods, with a warehouse at 7 Farringdon Road, London, next door to those of the American inventor and abolitionist, Thaddeus Hyatt (1816–1901). Between 1879 and 1882, as Art Superintendent at the Linthorpe Art Pottery in Linthorpe in Middlesbrough he designed over 1,000 pots. If his ceramic work from the 1860s onwards (for firms such as Mintons, Wedgwood, Royal Worcester, Watcombe, Linthorpe, Old Hall at Hanley and Ault) is considered, he must be amongst the most influential ceramic designers of any period. Much of his other work remains to be identified, although wallpaper designs for American, and textiles for French and German manufacturers have recently been located. A significant Dresser collection is held by the Dorman Museum in Middlesbrough. A Heritage Lottery Funded project draws attention to this. Some of Dresser’s metalwork designs are still in production, such as his oil and vinegar sets and toast rack designs, now manufactured by Alessi. Alberto Alessi goes so far as to say Dresser 'knew the techniques of metal production better than any designer who has come to Alessi'. One of his Old Hall designs is thought to have inspired Alan Garner's 1967 novel The Owl Service. Unity in Variety, as Deduced from the Vegetable Kingdom. London: James S. Virtue. 1860. The Rudiments of Botany, Structural and Physiological. London: James S. Virtue. 1859. 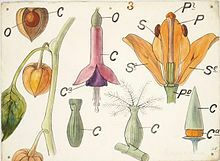 Popular manual of Botany. 1860. The Art of Decorative Design. Day & Son. 1862. ^ a b Halén, Widar (1 January 1994). Christopher Dresser: a pioneer of modern design. Phaidon Press. p. 17. ISBN 978-0-7148-2952-4. ^ a b Morley, Christopher (2010). Dresser's Decorative Design. B.B. Cargin. p. 256. ^ Alessi, Alberto (2017). The Dream Factory: Alessi Since 1921. Rizzoli International. p. 115. ISBN 978-0-8478-4906-2. ^ "Benefactors – Chris Lynch". The Blackden Trust. Flanders, Judith (2004). Inside the Victorian Home: A Portrait of Domestic Life in Victorian England. W.W. Norton. ISBN 978-0-393-05209-1. Halen, Widar (1990). "Christopher Dresser and the "Modern English" Style: His Later Designs for Wallpapers and Hangings". The Journal of the Decorative Arts Society 1850 - the Present (14): 10–15. JSTOR 41809171. Snodin, Michael; Styles, John (2001). Design & the decorative arts: Britain, 1500-1900. V&A Publications. Whiteway, Michael (2004). Christopher Dresser: A Design Revolution. V&A Publications. ISBN 978-1-85177-428-9. Lyons, Harry (1999). Ch. Dresser: People's Designer, 1834-1904, Exhibition by New Century, 2nd-19th June 1999. Alastair Carew-Cox. ISBN 978-0-9532801-1-7. Wikimedia Commons has media related to Christopher Dresser.